A beautiful village located in the valleys of the Alps. In addition to the beautiful natural green roofed white snow, the village of Lauterbrunnen in Switzerland have not one, but the 72 waterfalls. Lauterbrunnen means many waterfalls in Switzerland. It feels deserves to be called so because this village has many waterfalls. Of the 72 waterfalls that are here, the most famous waterfall Staubbach. With a height of 300 meters, Staubbach be one of the highest waterfalls in Europe. No less remarkable than Staubbach is Trummelbach waterfall at Mount Black Monk. Trummelbach hidden behind a giant rock, has a height of about 200 yards and fielded 20,000 liters of water per second. For a taste of the magnificent Trummelbach, you must ride the cable car that only works during the summer. There are several waterfalls that are very high and do not have the volume too much. Waterfall is like cutting back because of the falling water is dispersed wind. So when you stand under it, will not get wet because the water droplets that fall is very small and few. 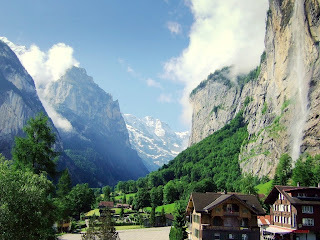 Lauterbrunnen village is not too big, only 795 square meters. 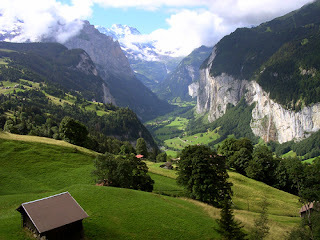 But the hypnotic nature makes you forget how small the Lauterbrunnen. Long as the eye could see, high rocks covered with trees and green grass will greet you. Equipped with fog and white snow on its roof. Green color here, too, is not monotonous, when the autumn, all the green color will turn yellow, orange to brown. Not to mention the fallen leaves will cover the path so that the soil became orange-brown. In winter, covered in orange uniforms with the white color of snow. When the snow melts, trees begin to blossom, small leaves welcoming the sun began to squirm. In the summer, you can hike into the hills surrounding the village. The most famous hiking area here is the Jungfrau. Let the leg you stepped in between the hard rocks of the Alps. Indulge your eyes with a carpet of grass with colorful flower buds. Allow your lungs to breathe fresh air typical of the mountains that can not be found in the metropolitan bustle. In winter, skiing would be the main agenda. Lauterbrunnen has hills with snow thick enough so that you can settle for skiing here.